At Arizmendi Oakland, there are no bosses, management hierarchies, or pay differentials. For Kamil Dawson, that is liberating, and sometimes challenging. Kamil Dawson of Arizmendi Oakland. Next month in Small Business Monthly, we're interviewing Joel Makower, author of Strategies for the Green Economy and executive editor of Oakland's Greener World Media, which publishes GreenBiz.com. To submit your questions to Joel Makower, search for Ask Joel Makower on our web site and leave your question or questions as a comment by Wednesday, February 10. Arizmendi Oakland takes its name and values from a World War II-era Basque priest who sought to rebuild the ravaged local economy by developing democratic, worker-owned businesses. Since adopting the successful Spanish cooperative model in 1997, the bustling bakery has been doing some serious business — last year, despite the economic downturn, profits were up, and it began opening on Sundays, all while providing generous salaries and benefits to its owner-workers. The Arizmendi chain of bakeries, which includes outposts in Emeryville and San Francisco, also continues to expand. This year, Arizmendi plans to open new locations in San Rafael and San Francisco's Mission District. I spoke to Kamil Dawson, who has been with the bakery since 2002, about co-owning — and working in — a thriving cooperative. 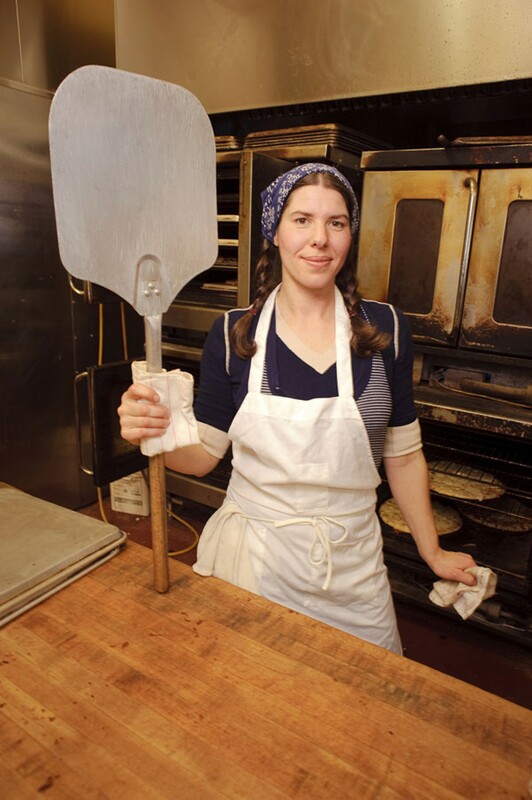 How did Arizmendi get started? We are modeled after the Cheeseboard in Berkeley. They started up in the early Seventies and grew and flourished. They knew they had to expand. But instead of opening new stores, we used a co-op model to open up our own bakery. It's like a franchise, with a similar business structure and recipes. Now we are a 26-member worker-owned co-op. In some collectives, you can buy in to the co-op and be part of the decision-making process, but you're not a worker. But Arizmendi being worker-owner, you own a percentage of the business but you are also set to work a schedule. What steps did you have to take to get the co-op up and running? Being a retail co-op, which was a newer kind of business model, it was hard to get a loan and capital, so we had to get private lenders and individuals who wanted to support the business. The Cheeseboard had individuals come in, and we trained with them and they shared their recipes and they gave us used equipment to get started. In the process, what was created was the Association of Arizmendi Cooperatives, and that's a separate cooperative and they're in charge of opening other bakeries. We give a percentage of yearly profits to the association. They give us important and needed services, such as accounting and legal support. What are the challenges and benefits of using a co-op model? There's a polarity between the positives and the challenging aspects. Consensus decision-making can be a real challenge. You may feel passionately about something but the group is focused on something else, and sometimes you are too passionate about something so you have to realize that you're preventing the process from moving forward. The benefits are that we pay ourselves equally, which is $19.41 an hour right now, no matter how many years you've been here. The equal pay is a reflection of a value that we wanted to uphold — that we are all equals and what you do is not greater than what I do. We share all of the profits and twice a year, we also get paid out a percentage of the profits from the previous year, which can range from an additional $3 an hour up to $10. That's a really nice addition to our already good base wage. Another benefit is having a voice in the business and being able to take up something in any number of areas that you want to be involved in. If you have skills in baking, you may come up with new product ideas, or, if I'm looking to retire in eight years, I can help with a benefits committee and review the 401(k) options. There are ways that your input has a voice in the business, and you have an outlet to being heard. How are decisions made in the co-op? Decisions are made during monthly meetings. We put it on the agenda. A subcommittee will create a proposal, and it's distributed four to five days before the meeting so people can read it over and ask questions before things are discussed openly in the group. How are the meetings run? Each meeting has a facilitator who has been trained. Each topic on the agenda has a certain amount of time attached to it and if we go over that time, then the facilitator checks in with the group to see if they want to do a vote or extend the time that we spend on that subject because we haven't gotten to a resolution. Even though you try to run a flat organization, doesn't hierarchy creep in? There is a natural hierarchy that happens, like it does in any job. But it's always important to be working with someone who can both take directions and who is willing to give directions, so someone who has the flexibility to wear different hats at different times. If there's a crisis, someone has to step up and take on a leadership role. How does conflict get resolved if there's no hierarchy? Sometimes riffs happen. If there is personal conflict, we have a mediation team, both outside and inside the bakery. A lot of work is team-based, and within your team you're working things out constantly. We try to defuse a problem as soon as it comes up. And some problems take a process with the entire membership to be resolved. It sounds like bringing in the right people is especially crucial. Yes, you need to bring on people who are self-motivated and disciplined, and who have a strong work ethic. Because if you don't do it, then someone else has to do it. No one is monitoring your progress; you have to be willing to follow through with tasks and responsibilities. The quality that we look for in members is someone who is not waiting for someone to tell them what to do. How do you gauge who would be a good fit? We watch how people work and how they take feedback. We bring people in for twelve hours over several weeks. They shadow someone and try out different tasks and we evaluate them. Then we bring them in for a group interview. If we really connect with them, then we bring them on for a six-month trial candidacy. We train them on specific shifts, and they go to meetings related to the history and other ideas that are important for understanding the collective. Do you think it's possible to adapt qualities of a co-op into a more traditional business model? Yes, by inviting more communication and allowing employees to share ideas and express their feelings. As a business owner it's about finding people to take on managerial roles who encourage communication and take employees into consideration and encourage employee decisionmaking. When you have an employee coming in every day and giving you their energy and their time, they are adding to the success of your business. So every way that you can support that individual — whether you're giving them fantastic pay or paid time off or benefits — then they're going to respond by also taking on a sense of responsibility, especially if you're inviting them to give feedback and creative solutions. To me, those are the basic things to making a successful and harmonious business — making employees a key ingredient to that success.